We’ll introduce 3 popular bathhouses in Asakusa-Oshiage which is known for sightseeing areas like Tokyo Skytree and Senso-ji Temple. There’s Jakotsuyu which has koi fish, Mikokuyu where you can see Skytree, and Daikokuyu for its large outdoor baths. Bathhouses have long been a staple of daily life in Japan. As a result, Japan’s unique bath culture, which includes details such as murals of Mount Fuji and entrance noren (curtains), have remained strong even in modern public baths today. There are several popular bathhouse spots in the Tokyo sightseeing areas Oshiage, where Senso-ji Temple and Tokyo Skytree are located, and Asakusa. We’ll introduce three of our recommended bathhouses from these areas. Jakotsuyu, located a seven minute walk from Senso-ji Temple, is a bathhouse with a history that has continued from the Edo period. The baths use a black-colored natural hot spring called Kuroyu. It is also complete with bathhouse-like facilities like a wall painting of Mount Fuji, denkiburo (*1), saunas, and rotemburo (outdoor bath), so we recommend this location to those that are experiencing bathhouses for the first time. *1 Denkiburo: a type of bath where small electric currents run through the water. It is effective for recovering from fatigue and other symptoms. Jakotsuyu’s rotemburo are built so that you can experience a Japanese-like quality to them. The garden pond that can be seen from the rotemburo in the men’s bath is also known for having koi fish. Chairs are also prepared so it would be nice to look at the koi fish while sitting if your body has gotten a little too hot in the baths. The water in the pond falls from above like a waterfall. The sound of the water falling is very pleasant to the ear. This is an especially popular bath at Jakotsuyu. The atmosphere in the rotemburo of the women’s bath is slightly different. It is characterized by walls that mimic that of shoji (sliding doors) and an interior decorated with plants. High powered jets (*2), body jets (*3), and denkiburo are available in both the men’s and women’s baths so all guests can enjoy their bath no matter where they are. *2 High powered jets: a bath designed to vigorously shoot hot water from a device installed inside the bathtub. *3 Body jets: a bath designed to shoot hot water from all directions. Usage of the baths by overseas visitors have also been reportedly on the increase since around 2006. As a result, the ticket machines are available in English, Chinese, Korean, and Japanese, for a total of four languages. The bathhouse is also complete with amenities such as shampoo and body soap provided by the bathhouse and rental towels (a small towel is 30 yen plus tax while a large is 60 yen plus tax). You can casually enter the baths without having to worry about bringing anything with you. An all-in-one set (140 yen plus tax) that comes with a towel, razor, and toothbrush in a handbag is also sold by the bathhouse. 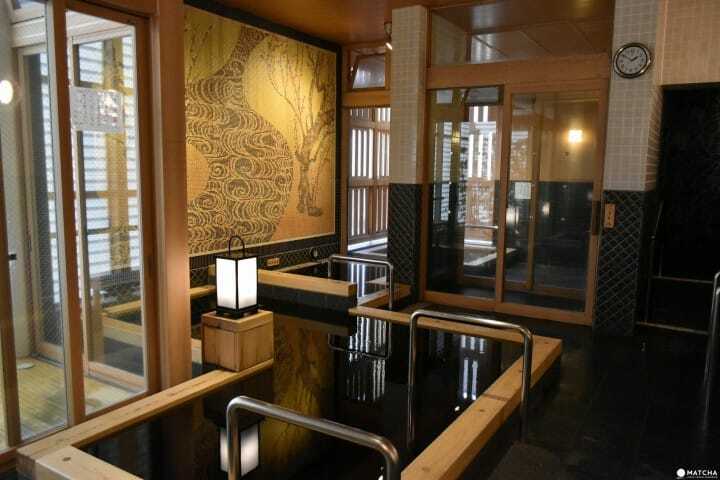 Those with tattoos can also enter the baths, making this a bathhouse that is also easy to use for overseas tourists. There are also other great services such as being able to use cellphone chargers for up to 20 minutes per person. Jakotsuyu does not provide luggage storage, so we recommend going to the bathhouse after storing your belongings with services such as coin lockers. Next PageOn the next page, we will introduce our next recommended bath house.